Looking flawless, pore-less, blurred and overall perfected tends to be the look I go for in makeup. If I could walk around looking like I've been Facetuned that would be great! 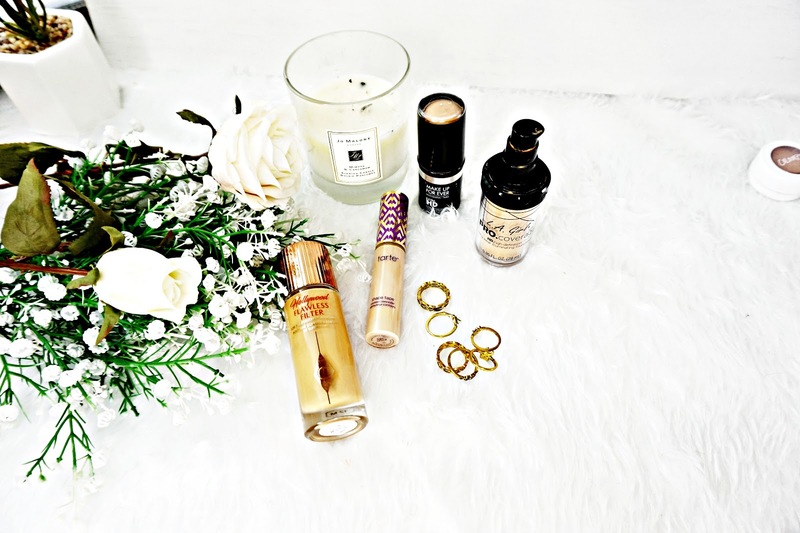 Luckily I've found a few makeup products that really give me that perfected, flawless look. So here they are. This product is brilliant for giving the skin a perfected, almost airbrushed look to it. It contains soft focus ingredients that blur fine lines and pores as well as light reflected pigmented that gives the skin a serious glow to it! It is really glowing but not slippery or oily on the skin, it kind of sets. I have heard this can be used as a foundation but I personally wouldn't because it is so dewy and doesn't have much coverage. I really like it as a primer. It can also be used as an illuminator over foundation, for a subtle sheen to the cheek bones. Makeup applies really well over the top too. It's the closest thing I've found to a real life filter. Another product that gives me seriously perfected skin is this stick foundation from Makeup Forever. I don't know how this foundation does it but it gives skin a seriously smooth, plump look to it. The finish is on the dewy side, which I love. It takes seconds to blend in and my skin is looking so good! It has decent medium coverage that can be built up to full, but I found this covers everything I want it to. My only gripe with this is the staying power, it gets oily looking really quick on me. The foundation doesn't breakdown though so it's nothing a powder wont fix. Another foundation (on the more affordable end) that gives me super smooth, flawless looking skin is this offering from LA Girl. This has everything I want in a foundation. It has a really good, medium to full coverage and a beautiful glowing finish! The consistency of the foundation itself is really watery which makes it so easy to blend. It wears really well on me to. I don't have a bad word to say about this. To cover everything, without caking or creasing this is the concealer you need. This has some serious full coverage. It has a satin finish which makes it look undetectable on the skin. The formula is so creamy and easy to blend, yet the coverage is there. This doesn't crease, flake or fade on me. I tend to use it under my eyes to conceal my dark circles and it works brilliantly. I would recommend going a shade lighter than you normally would if you're going to use this under the eyes, I just find it adds a bit more brightness. This is a flawless skin BFF. The name of this powder pretty much sums this up! To set everything down and further blur those problem areas this is the powder I reach for. It's so finely milled it doesn't look cakey or like powder on the skin, no matter how much I apply. It sets my makeup in place all day, while blurring my fine lines. There's nothing more I could ask from a powder. Now obviously these products don't make you like you're permanently Facetuned but they are the next best thing!